At Used Tires of East Tennessee most of our business comes from repeat customers because they know we are honest, dependable and fast. Used Tires of Tennessee is a member of the National Institute for Automotive Service Excellence and we are a locally owned and operated business. Understanding our customers and their needs has enabled us to offer a full line of tire services, the top brands in the industry and an extensive inventory of products. We Know Tires. We have Decades of Experience. We pride ourselves in on providing your with fast service and a huge inventory that ranges in price so you can always find a tire you can afford. Most of our customers at Used Tires of East Tennessee have purchased tires from us time and time again, telling us that they would not purchase tires anywhere else. We would love the opportunity to serve you and your car with the same courteous customer care. 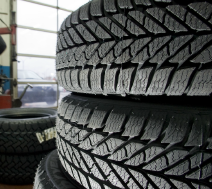 Visit our Tire Services Page to get more information about what we offer at Used Tires of East Tennessee.